Since dust mopping or sweeping is the most important step of any floor cleaning, we wanted to provide our visitors and friends with tips to dust mopping when it comes to residential laminate floor cleaning. Dust mopping or sweeping is always the first step when laminate floor cleaning which must be completed prior to any wet cleaning is perform on laminate floors. Dust mopping is designed to be performed to remove all the loose soils such as dust, grit, dirt, etc. from the laminate floor. However, just because it is the first step when performing laminate floor cleaning, this does not mean you can only perform dust mopping or sweeping the laminate floor when you wet clean the floor. It can be performed on a daily basis and in fact for commercial building with massive amounts of foot traffic like in a retail store, we recommend they perform dust mopping at least twice daily and as often as their budget will permit. The more often you remove the loose soil from your laminate floor, the longer your laminate floor will remain good-looking and also extend the life of the laminate floor from premature wear and tear. The following is a concise list of tips that will assist our residential homeowners with information to improve their overall process for laminate floor cleaning and even speed up the cleaning process for homeowners. Complete dust mopping or sweeping after high cleaning tasks such as light fixture, vents and air ducts and furniture cleaning. Always use the best quality dust mops available and we highly recommend using a microfiber dust mop tool for the best results. Avoid running the dust mop over wet or sticky spots on the laminate floor. These will cause a gummy mess. Always switch your dust mop heads or clean the dust mop immediately after using it. This will always improve the amount of dust collected during the task. 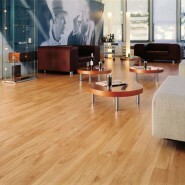 Inspect the floors for attached dirt on the laminate floor that will take additional wet cleaning. Avoid using dust mop treatments. A quality dust mop such as a microfiber pad will perform excellently. After you have completed your dust mopping of the vinyl floor, shake the dust mop out in a trash can, spray with a dust mop treatment in preparation for the next time you use the dust mop when vinyl floor cleaning.